Although bioactive compounds in milk and dairy products have been extensively studied during the last few decades – especially in human and bovine milks and some dairy products – very few publications on this topic are available, especially in other dairy species’ milk and their processed dairy products. Also, little is available in the areas of bioactive and nutraceutical compounds in bovine and human milks, while books on other mammalian species are non-existent. Bioactive Components in Milk and Dairy Products extensively covers the bioactive components in milk and dairy products of many dairy species, including cows, goats, buffalo, sheep, horse, camel, and other minor species. 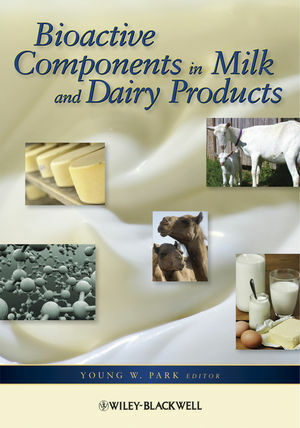 Park has assembled a group of internationally reputed scientists in the forefront of functional milk and dairy products, food science and technology as contributors to this unique book. Coverage for each of the various dairy species includes: bioactive proteins and peptides; bioactive lipid components; oligosaccharides; growth factors; and other minor bioactive compounds, such as minerals, vitamins, hormones and nucleotides, etc. Bioactive components are discussed for manufactured dairy products, such as caseins, caseinates, and cheeses; yogurt products; koumiss and kefir; and whey products. Aimed at food scientists, food technologists, dairy manufacturers, nutritionists, nutraceutical and functional foods specialists, allergy specialists, biotechnologists, medical and health professionals, and upper level students and faculty in dairy and food sciences and nutrition, Bioactive Components in Milk and Dairy Products is an important resource for those who are seeking nutritional, health, and therapeutic values or product technology information on milk and dairy products from the dairy cow and speciesbeyond. Young W. Park, PhD, is Professor of Food Science at the Georgia Small Ruminant Research & Extension Center, Fort Valley State University, Fort Valley, GA, USA, and an Adjunct Professor, Department of Food Science and Technology, University of Georgia, Athens, Georgia. Dr. Park has devoted his research career in goat milk and dairy goat products research for the past 27 years, publishing more than 240 revered journal articles, book chapters, and invited papers and abstracts in national and international conferences. He co-edited the Handbook of Milk of Non-Bovine Mammals by Wiley-Blackwell.